We are back. 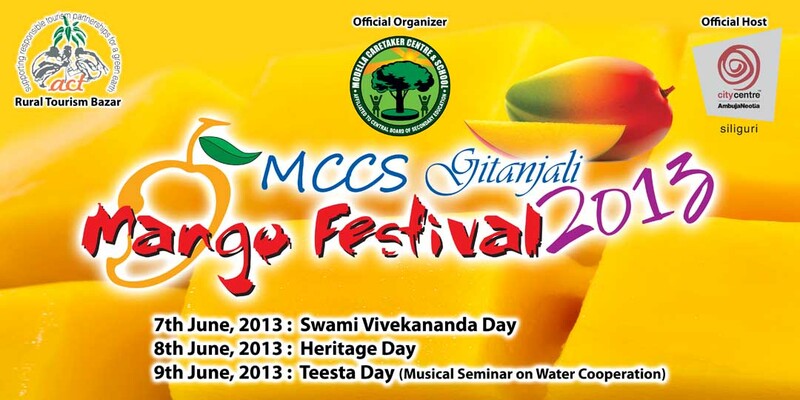 Forced to take a breather in 2012 due to unavoidable circumstances, we are back on track to present you the MCCS Gitanjali Mango Festival 2013, the one of its kind event held annually since 2010 in these parts of the country. If relentless inquiries from participants and patrons on the 2012 hiatus stimulated us into re-organising the festival this year, the opportunity to uphold the cultural heritage mankind has woven over the years along with the scope to showcase hidden talents is incentive enough for us to decide, the show must go on..
And so, here we are additionally offering you the juicy prospect to slurp, sample and sink your teeth into that mother of all pulps – the mango fruit. The festival is being organized by Modella Caretaker Centre and School (MCCS) using mango, the National Fruit as a medium for inheritance of heritage by the Generation Next. In 2010 the festival was dedicated to the 150th birth anniversary of the 1st Noble Laureate of India, Gurudev Rabindranath Tagore. Poet, painter, social worker all rolled in one, Gurudev confirmed conservation of the rich Indian heritage for the future generation, hence the nomenclature, ‘Gitanjali’ Mango Festival’ linking the event with his namesake collection of works. Tagore’s association with mango is legendary. His philosophy, which was institutionalized into education form through the International University, Viswa Bharati at Shantiniketan was set up by his father, Maharshri Debendranath Tagore in 1863. The fledgling centre took off in two rooms in a mango orchard. Shantiniketan inmates often referred to Gurudev’s love for mango, which also reflects in his works ‘Gardener’, ‘Kabuliwala’, etc. Mango has lured even the sages and kings of this great country. Legend has it that Lord Gautama Buddha, the first known person to have spread Indian heritage globally, had a taste for the fruit so much so that famous dancer Amrapali had offered him a mango orchard at Vaishali, during his travels. Mughal emperor Akbar also was a mango connoisseur. No wonder, mango these days is a sought after gift in diplomatic circles. Just goes to show the fruit is irresistible. The mention of Mango in India goes back to 2000 BC in the Upanishads. Mango grows uniformly across the tropics of Asia, but the fruit’s association with this country is linked with its cultural heritage. It is argued that the fruit originated from India’s Northeast and the wild variety is said to have been found in Mizoram and Arunachal Pradesh. What began in 2010, flourished in 2011. Fresh ideas were incorporated and the Association for Conservation & Tourism (ACT) organized a Rural Tourism Bazaar, the first of its kind of activity, highlighting conservation of the rich rural heritage to a special kind of livelihood process called tourism. This event organized by ACT received much appreciation from neighbouring states and countries. The Festival saw mango growers from across West Bengal flock in with their most possessed and prized products. The Mango Bazaar with commercial varieties from across India and events like Mango Eating and Recipe Competitions proved heavy crowd pullers. Students participated in Sit & Draw, Ethnic Dress, Face of the Day, Live Radio Quiz, cultural programmess etc and the evenings were a blend of cultural soirees, workshops, seminars and lectures on several heritage mediums. The 2011 Festival and its venue were complimentary to each other. The name of the venue also sourced from the works of Gurudev Rabindranath Tagore, Uttarayon believes on the principles of conservation of Indian heritage. At the micro level, it was The Orchid Restaurant at Uttarayon which hosted the festival in 2010 and 2011. In the process, a mango orchard ‘Amrakunja’ dedicated to mango has developed at the site. Since then, the venue has developed into one of the most impressive centres in North Bengal and Sikkim. The Mango Festival slipped up in 2012 due to unavoidable circumstances. But, if the organizers believed people had forgotten the festival dedicated to mango, they were horribly wrong. The first shout came from the mango growers. The cry grew louder as people and organizations related to heritage conservation, members of the student community and conservation crusaders picked it up. The appeal was strong enough for the organizers MCCS and hosts Uttarayon to yield to the demand. The die is now cast and we are back to organizing the third MCCS Gitanjali Mango Festival, 2013 at City Centre, Uttarayon, Siliguri on 7th, 8th and 9th of June. The Festival this year would be dedicated to Swami Vivekananda to commemorate his 150th birth anniversary. Vivekananda re-introduced Indian heritage to the modern world. Now comes the best part. Since the mango growers have discovered that the MCCS Gitanjali Mango Festival is more of their baby, they have decided to bring plenty of the fruit with them for the Festival visitors to take away. This year, participants of the Mango Eating event will compete in 03 categories: Male, Female and Couple. Since there is a great rush for enquiries, the organizers have decided to accept names registered IN ADVANCE ONLY. Three additional prizes 1) Best Female Mango Fashion, 2) Best Male Mango Fashion and 3) Best Couple Mango Fashion; would be introduced to the Festival this year. ‘’Best Mango Friends Group’’ award to a group of minimum 10 friends with Mango Fashion would be awarded on each day of the Festival. Mango Recipe Competition and classes for Mango Cookery would be held on all three days of the Festival at The Orchid Restaurant. 1) Mango Eat - name in full to 9733005437. 2) Mango Cook - name in full, date interested (7th, 8th or 9th) to 8420146585. 3) Mango Grow - name in full, name of place of residence (like Malda or Murshidabad or Uttar Dinajpur etc) to 9733005437. 4) Mango Fashion - name in full to 9007168540. 5) Those interested in Mango Dinner on 7th, 8th or 9th June, 2013 please book through sms ‘Mango Meal Date (7th, 8th or 9th)’and send to 8420146585. 6) Any organization or individual interested in any activity or event with theme Mango can call 9733005439. 7) Anyone interested in ACT Rural Tourism Bazaar can call 9733000444. The ACT Rural Tourism Bazaar will offer to demonstrate models, provide counselling sessions for setting up Rural Tourism projects and provide information to interested travellers on the various Rural Tourism Destinations of East and Northeast India, Nepal, Bhutan, Bangladesh and Myanmar. Take away travel books by popular authors from North Bengal and Sikkim would be available at the event. Rural Tourism Festivals would be highlighted and the ‘’ACT Teesta Awards’’ will be declared for the Best Initiatives in the Teesta Landscape. Proposals are requested to be sent to act.easthimalaya@gmail.com by the 29th of May, 2013. Several people and organizations are committed towards preservation of society, environment and culture. The Festival will showcase many such works including animal welfare, people welfare, livelihood options, cultural conservation, weaving & crafts, heritage, sky watching, climate change etc. A special event on the ‘’2013 UN Year for Water Cooperation’’, a complete musical seminar and documentary, based on the theme ‘Teesta Parer Katha’ would be presented at the Festival in addition to the regular cultural shows promoting folk culture. Will there be any drawing competition? That's really nice that you have shared information about mango festival. From the spiritual calm of monasteries to tracing scientific development in a Science Museum, from natural beauty to man made beauty, Siliguri (Shiliguri) has it all and more. For tourists, check out these hotels in Siliguri.